As Jesus himself demonstrated to the two disciples on the Emmaus Road, to interpret the Scriptures aright one must maintain their internal unity, a unity where Christ himself is the nexus of all Old Testament pathways. 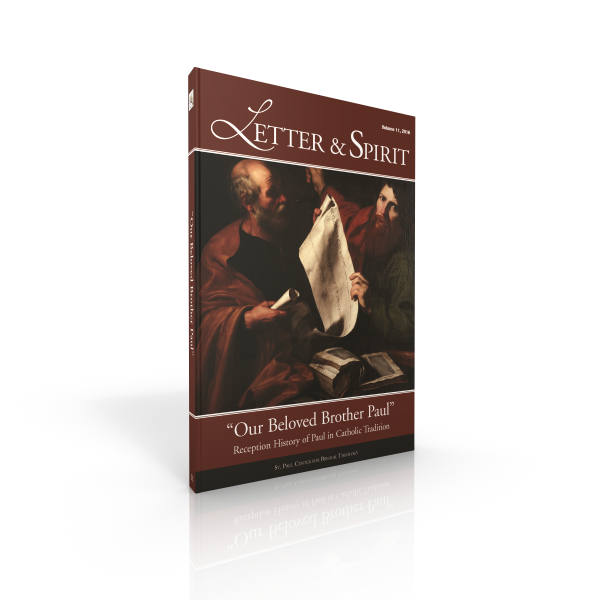 In Letter & Spirit, Vol. 11, this standard for interpretation is examined in light of the theology of St. Paul’s writings. This issue explores the reception history of St. Paul in the Church in ways that demonstrate and illumine Paul’s hermeneutic of Biblical unity and coherence, a hermeneutic that has led to the Church’s understanding that the New Testament fulfills, completes, and transcends the Old. Articles include “Partakers of Adoption: Irenaeus and His Use of Paul” by Ben C; Blackwell, “Origen, Augustine, and ‘Works of Law’” by Benjamin P. Blosser, “Cyril of Alexandria’s Reception of the Apostle Paul” by Daniel Keating, “Aquinas’s Reception of Paul: Reading the Testaments Together” by Matthew Levering, “Aquinas’s Reading of Romans: The Multiple Literal Sense and Contemporary Perspectives on Paul” by Scott W. Hahn and John A. Kincaid, “The Reception of Paul in the New Lectionary” by Brant Pitre, and more.